Fancy a week in New York City with your significant other or friend? Play now at bgo Casino who are also offering 21 cash prizes. 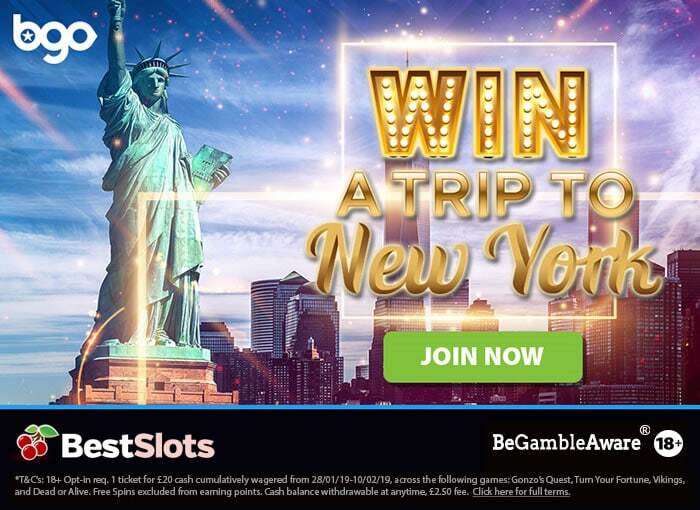 The Win a Trip to New York promotion runs until Sunday the 10th of January (2019) – to take part, you need to opt in (via the ‘Promotions’ section) and then wager £20 on the eligible Net Entertainment slot games. This will give you 1 entry to the prize draw. In terms of the eligible slot games, you need to wager £20 on Turn Your Fortune, Dead or Alive, Gonzo’s Quest or Vikings. The latter, Vikings, is the obvious choice as it’s based on the hit television series and offers payouts of 10,000 times your stake on every free spin in the Raid Spins feature. However, I recommend Dead or Alive which is a cult classic – with 5 reels and 9 paylines, you join prolific outlaws Billy the Kid and Jesse James in the Wild West. Playable from just 9p a spin on all devices, it comes with a Free Spins feature where you begin with 12 free spins and a 2x multiplier. If you trigger the feature with 5 scatters, you’ll win 2,500 times your stake. There’s also a Sticky Wild feature within where Wanted Posted wilds become sticky – they also give you more free spins. You can also retrigger the feature for a maximum of 29 free spins (with a doubling multiplier). You can win 3,000 times your stake on every free spin too! Sign up now at bgo Casino to get 10 no deposit free spins – with no wagering requirements. On your first deposit, there’s a 100% bonus up to £200. They have lots of promotions and exclusive Playtech slot games like Big Shots.